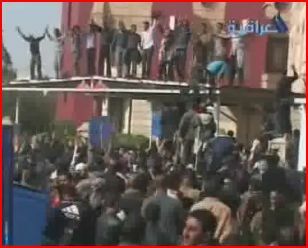 The 25 February popular protests across Iraq have generated some interesting fallout. Yesterday, parliament speaker Usama al-Nujayfi called for early provincial elections. (His own brother Athil, the governor of Mosul, had been a target of the demonstrators there. ) Today Prime Minister Nuri al-Maliki reiterated Nujayfi’s call, but went on to call for the resignation of Athil al-Nujayfi as Mosul governor, saying he himself had personally supported the decision of State of Law governors in Babel and Basra to resign because the population demanded it. These are interesting reactions, not least from Maliki who had earlier described the demonstrations as a “Baathist plot” at the time when they were being planned. Of course, Iraq had provincial elections as recently as January 2009, and those elections were deemed perhaps the most progressive in post-2003 Iraq in terms of an atmosphere focused on bread-and-butter issues rather than sectarian bigotry. The resultant governorate assemblies are operating according to the provincial powers law and the provincial elections law that were both adopted in 2008. The assemblies are supposed to sit for four years, and, needless to say, there are no mechanisms for early elections/governor resignations based on popular protests as such. The statements by Nujayfi and Maliki prompts some interesting questions. Is there anything to suggest that the current national assembly itself – i.e. the parliament in Baghdad – is any less dysfunctional than the provincial assemblies? Symptomatically, it is on holiday for another week right now! Should it, too, perhaps be re-elected as a matter of urgency, with maybe a new premier and a new speaker? 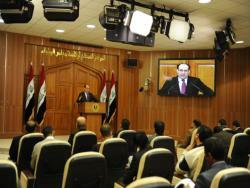 And of course, Maliki says governors across Iraq should resign since the people demand it. What will he do if protestors start asking for his own resignation? The most readily understandable takeaway from the protests as articulated by Iraqi elite politicians is the demand for early elections at the sub-governorate level. Those local assemblies were supposed to be elected six months after the governorate elections according to the elections law adopted in 2008, but that just never happened and many local-level assemblies are still operating with people who have been in their positions since the Paul Bremer days. Unlike the calls for new provincial elections, the demand for sub-govenorate polls is at least clearly in conformity with the established legal framework. Also, there are procedures in place for changing governors at the local level if needed, but again, the legal way of doing this would be for the existing assemblies to make the necessary moves. This was not what Prime Minister Nuri al-Maliki had wanted to happen. Yesterday he announced that the big demonstrations across Iraq that had been scheduled for today should not go ahead since they were “suspicious”. For more than a week, Maliki partisans in government (Amir al-Khuzai, the “national reconciliation minister), parliament and in places like Dhi Qar have made references to neo-Baathism and even al-Qaida in order to cast a slur on today’s planned events. But the protests went ahead across Iraq today, and, frankly, if the protestors were all “suspicious Baathists” then Maliki is in for a challenge. True, there were protests in some areas that have sometimes been accused of being hotbeds of supporters of the former regime of Saddam Hussein, like Bayji near Kirkuk. For sure, there were expressions of support for the demonstration by politicians who have been branded Baathists by Maliki and his allies, like Zafir al-Ani of Iraqiyya. But the protests today – and indeed the growing wave of discontent in Iraq over the past few weeks – were spread across the entire country, from Sulaymaniyya in the Kurdistan Regional Government area to Basra in the south. Indeed, the striking aspect of today’s demonstrations was their national character. For one thing, we have seen Kurds rise up against the dominant Kurdish parties, Shiites challenging the hegemony of Maliki’s own “all-Shiite” alliance, and Sunnis complaining against their Sunni local politicians. The cries for better services and employment conform to a universal pattern that has been in emergence over the past few weeks. But more importantly, in terms of slogans and demands, there are signs of a true synthesis of genuine nationwide opposition to the supposed “government of national partnership” that was formed, tentatively at least, in December 2010. The signs were there already some weeks ago, when Shiites in places like Hamza (Qadisiyya), Kut (Wasit), Dhi Qar and more recently Rumaytha (Muthanna) rose up against governors closely allied with Maliki and the other leading Shiite Islamist parties, in some cases even burning down government offices. Today’s reported resignation of Shiltagh Abbud, Maliki’s ally and governor of Basra, just highlights the descent of Maliki’s State of Law since they won an outright majority in the local council there in the January 2009 governorate elections. Not that leaders described by some as solid “Sunni” leaders escaped censure by the protestors either: Today, Mosul is in revolt despite having been something of a political fiefdom for parliament speaker of Iraqiyya, Usama al-Nujayfi, and his brother Athil, the local governor, for the past couple of years. But there is more to this than that. In Dhi Qar, demonstrators demanded better services, an end to corruption, and, importantly, criticised the system of ethno-sectarian quota-sharing that forms the basis for all of Iraq’s post-2003 government and that is supported by the United States and Iran alike. In Baghdad, protestors are trying to destroy the concrete blast walls put up by the United States since 2007 in its own attempt to engineer “sectarian” reconciliation, American-style, and are calling for a unified Sunni–Shiite political project, with echoes from the uprising against the British in 1920. Again, this seems to indicate a desire for more profound reforms and system change. Some of the activists are highlighting the absence of properly elected local councils at the sub-governorate level across Iraq as one very immediate grievance. What this all shows is that the internationally sponsored “consensus” and “power-sharing” project in post-2003 Iraq is in crisis. Power-sharing between leaders is of limited value if assumed “community leaders” do not enjoy support in the constituencies they are supposed to represent, and indeed if those constituencies begin attacking the ethno-sectarian quota-sharing concept as such. Ironically, part of the problem with the new Maliki government could be that there are simply too many on the inside and no healthy opposition on the outside. As of today, the only true opposition party to speak of in parliament is the Kurdish Gorran as well as some independent deputies. Perhaps today’s protests could induce more Iraqi politicians to think carefully about the virtues of taking part in a government that seems to care more for itself than the Iraqi people. Today’s demonstrations appear to have involved thousands rather than tens of thousands in the affected areas, so there is still some way to go before we reach Tunisian and Egyptian proportions. Still, after the initial protests in Baghdad in early February seemed somewhat quixotic and marginal with their Che Guevara posters, today buildings were burnt and shots were fired. The Iraqi government and its international supporters should understand that what we saw today is an attack on some of the very principles underlying the deal-making that led to the formation of the current government, despite its so-called “democratic” façade. After a marathon session in the Iraqi parliament, Iraqi politicians today passed the budget for 2011. The key figures are as follows: Income, 80.9 trillion Iraqi dinars (ID); expenditure, 96.6 trillion ID (of which 30 trillion ID is investment); deficit 15.7 trillion ID. The budget is based on an expected daily oil export of 2,2 million barrels and an oil price of USD 76.5 per barrel. The big money in this budget goes to the central government in Baghdad and the Kurdish Regional Government, underlining the asymmetrical nature of Iraq’s federalism despite constitutional provisions that arguably could have given the unfederated governorates more rights and money. The biggest single ministry spending post is defence and security with 14 trillion; unless it is a typo education will get 9 trillion which seems generous compared with the military spending. It is interesting that the petrodollar scheme that was introduced in 2010 and gave a dollar for each barrel of exported oil to the producing governorates is perpetuated (to total some 1.6 trillion ID), and will also include petrodollars that accrued in 2010 but have yet to be spent. There had been some discussion that the scheme would be made universal to all of Iraq at the expense of the producing governorates, but instead the two ideas appear to have been merged into one as the ministry of finance is given the task of allocating additional petrodollars based on national production to all governorates based on population (i.e. a lot less per governorate than the producing governorates get under the original scheme). Kurdistan is excepted from the petrodollar arrangement until it has sent in an audited account of its oil-industry activities for 2010–2011. Other than that, the Maliki government has gone some way towards compromise with the Kurds on oil export. Whether it has gone all the way, as Maliki appeared to promise in an early-February interview when he said that the KRG oil contracts had been fully approved, simply remains unclear in the current budget. Maliki recently backtracked in a televised press conference and put the taped video on his website, thereby seemingly reverting to the previous agreement between the oil ministry in Baghdad and the Kurdish authorities of paying costs but not profits for the foreign companies. As expected, the key numbers pertaining to this issue are not included in the budget law as such, and even in the annexes – not yet published by parliament – they are unlikely to specify the exact payment that will be given to the foreign companies. But it is interesting that in a leaked version of these numbers that has failed to receive much attention, from the Sumaria news agency on 9 February, a heading of around 2.05 trillion ID was set aside as “contribution to the costs of exporting oil including entitlements under the contracts signed with foreign companies in Arbil”. At any rate, money has definitely been set aside for exports for Kurdistan to resume, and the Kurds skilfully managed to avoid controversy over the issue in parliament by seeking assurances from the finance minister from Iraqiyya instead of attempting to spell the issue out in the budget law itself. Some commentators have hinted that there may be transparency issues here, but DNO regularly reports its profits so some numbers should emerge eventually. 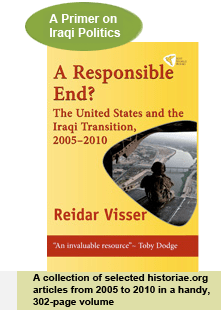 It is of course remarkable that a party like Iraqiyya should go as far as this in underwriting a Galbraithian economic model for Iraq, but it can be explained in terms of realpolitik with reference to the party’s ongoing campaign to seek Kurdish support for the establishment of the strategic policy council that at least its leader, Ayad Allawi, remains focused on. The bigger challenge for the Kurds these days seems to come from the people in their own streets. That applies to other parts of Iraq too: Tension is simmering in Kut and Ramadi as well. In other words, the test for all of Iraq’s leaders going forward, regardless of whether they are Shiites, Sunnis or Kurds, is whether they can do more than divvying up the spoils between themselves and actually deliver the services and jobs that the Iraqi people are asking for. The budget is only a first step. Note: The exchange rate for the Iraqi Dinar (ID) has been calculated at 1,200 ID to the US dollar. “Billions” and “trillions” are given in accordance with Anglo-American usage in which a billion is the same as a “milliard” in many European languages and Arabic and a trillion is 1,000 “milliards”. It seems perhaps somewhat unusual that the fourth quarterly report of a Norwegian oil company should provide relevant information for understanding the tectonics of centre–periphery relations in Iraq, but that’s exactly what it’s like in today’s Iraq. Thanks to a political situation in which both the secular Iraqiyya and the Shiite Islamist National Alliance are interested in obtaining Kurdish support, most of their political leaders are reluctant to talk publicly about the specifics of Baghdad–Arbil relations. As a result, we get situations like the apparent Maliki–Shahristani controversy over oil exports from Kurdistan, with intense speculation in the international financial press as to whether the oil contracts of the Kurdistan Regional Government (KRG) have been approved by Baghdad or not, and with a virtual media blackout on the same issue in Iraqi media leading to a confused situation. DNO’s press release from its Q4 presentation contains two interesting pieces of information with respect to the controversy. Firstly, it says “DNO has been advised by the KRG that there will be an interim period until a federal petroleum law for Iraq has passed the Iraqi parliament later this year”. It goes on to add, “the commercial terms for the interim period are under evaluation and will be reported to the market in due course”. What this seems to indicate is that when Maliki said the contracts of the foreign companies operating in Kurdistan would be “respected”, he probably went further than what the rest of his government had agreed to. Had there been full approval of the oil contracts, as Maliki clearly said in early February, there simply would have been no need for the “evaluation” of “commercial terms for the interim period”, or indeed for any “interim period” and a long wait for the oil and gas law at all. In this respect, it should be added that the oil minister, Abd al-Karim Luaybi, has since expressed a point of view that went in the same direction as Shahristani as regards the need for the oil ministry to consider the contracts, although Luaybi did not go as far as Shahristani did in calling for changes to them. Moreover, today, just after his return from Kuwait, Nuri al-Maliki was asked this very question by AFP during a televised press conference in Baghdad. Who was right, Maliki or Shahristani? Maliki fudged it in his answers. He answered that the basic agreement was that concluded between the ministry of oil and the Kurdistan natural resources ministry according to which the central government would cover the “expenses” (nafaqat) of the foreign companies. He then went on to say, “as for the legal aspect [of the contract], that is a different matter” and refused to say anything more, thus clearly making a distinction between paying expenses to the foreign companies and paying profits as per their contracts. In essence, he retreated somewhat from his sensational statement in early February, when one could get the impression that the contracts had been approved. It seems clear too, that the budgetary process, which will supposedly culminate with a political meeting tomorrow and a vote in parliament on Sunday, will not bring the clarity to this issue that some had been hoping for. It is interesting in this respect that Farhad Atrushi, a Kurdish deputy, today urged that parliament give the oil and gas committee a greater say in finalising the budget in the last-minute round of adjustments. The Kurds appear to be considering Adnan al-Jannabi, the head of the oil and gas committee and a member of Iraqiyya, as a potential ally in this game – which is remarkable given that Iraqiyya in principle shares Shahristani’s centralist position on oil issues. The reason is probably that some members of Iraqiyya keep courting the Kurds in order to obtain their good offices in their own fight for a national strategic council, and seem prepared to sacrifice other priorities to achieve that aim. In parliament, at least, there appears to be no one from the all-Shiite National Alliance that is following in the footsteps of Abd al-Hadi al-Hassani who used to state a position similar to Shahristani in the previous parliament, and with most deputies preoccupied with securing allocations for their own governorates there has not been much in the way of discussion about the KRG oil deals in that forum so far. Nonetheless, going back to the DNO report, it seems that the DNO management may be taking the assurances from their Kurdish paymasters perhaps a little too literally when they matter-of-factly predict the passage of an oil law “later this year”, as if the vote will happen automatically in accordance with the Kurdish demands presented to Maliki as basis for their joining his government. It would perhaps be prudent for DNO to at least take into consideration the possibility that there may conceivably be a somewhat longer “interim period”, since like many of the 18 other promises to the Kurds, Maliki is really powerless to do anything about them except wait for parliament to act. In the meanwhile, the Kurds will come under pressure from the operating companies to fix payments, and Maliki will come under pressure from nationalists who insist on a coordinating role for the oil ministry. It is still unclear, then, what makes the situation today really different from in 2007, when Maliki and the Kurds also failed to agree on an oil and gas law in the end. One potential avenue for compromise is perhaps the fact that in the previous interview with AFP that he effectively repudiated today, Maliki did at least articulate an argument for letting foreign companies who invest in Kurdistan earn more money than those operating in the south because of the risks they take. That argument probably still stands, and should in theory make it possible to reconcile the oil ministry in Bagdhad with Arbil if both sides show some flexibility. *Originally written on basis of the live broadcast from Iraqiyya and later updated with some minor adjustments on the basis of the recorded version of the press conference, with better sound quality, published by Maliki’s office. Finally, there are at least some limited signs that also Iraqi parliamentary deputies are reacting against the attempt to solve problems between politicians by making the government ever bigger, at the expense of the Iraqi citizens: Today, a proposal from President Jalal Tabalani to expand the number of vice-presidential deputies from three to four was rejected by a big majority in parliament; some say by as many as 80 percent of the deputies present. Not all of the opposition to the proposal is equally interesting from the point of view of Iraq’s uneasy journey from an identity-oriented form of politics towards a more issues-based one. Indeed, some of the opponents are simply personal opponents of the all-Shiite National Alliance nominee to one of the vice-presidencies, Khudayr al-Khuzai. Similarly, some Iraqiyya deputies indicate they intend to freeze out Khuzai by having a vote on only three deputies individually, adding however that they want to have a Turkmen to fill the third position, thereby reiterating Talabani’s original ethno-sectarian quota logic, just in a slightly different format. The same pretty much holds true for a proposal by the Iraqiyya deputy Kazim al-Shammari to further expand the number of deputies to five in order to accommodate a Christian representative. However, some of the protests against today’s proposed amendments are couched in more interesting terms. Shammari’s proposal for five deputies was in fact accompanied by a demand for lowering the salaries of the president and his deputies since the positions are “ceremonial” (tashrifi) only. Others have gone further. Mustafa al-Hiti, also of Iraqiyya, has claimed that a fourth vice president would be a waste of public money, and also added that the president himself holds only ceremonial powers so it would be better to spend the money on schools and hospitals than on unnecessary deputy positions. Zuhayr al-Aaraji, another Iraqiyya deputy, said positions should not be created for the purpose of satisfying individuals unless there was a real need for them. Sabah al-Saadi, an independent ex-Fadila member of the National Alliance, and the Kurdish Goran party also joined the criticism. This tentative constellation of deputies who finally try to put the demands of the people for services higher than the demands of the politicians for jobs for themselves is a healthy trend in a parliament which has just experienced a government-formation process based on the well-known, retrograde quota-sharing principle, and whose pressing budget process again failed to move forward today. They are, unsurprisingly, to a large extent people who are shunned by Western and Iranian diplomats, who both systematically reiterate and strengthen the ethno-sectarian quota system through their choice of conversation partners. It deserves mention that in early 2009, Mustafa al-Hiti was the parliament speaker candidate for the 22 July front, the previous promising trend in parliament that was largely undermined by Iranian efforts to recreate a broad Shiite alliance and American efforts to keep Kirkuk off the agenda during 2010. Today, Qusay Abbadi from Basra, another Iraqiyya deputy, is talking about constructing a broad opposition alliance instead of focusing on ministerial positions for their own party. That would be a welcome addition since the Kurdish Gorran is the only real opposition to speak of today, and a timely one as well, since governorate buildings are already burning in Kut in Wasit governorate in the most serious manifestation of Egypt-style protests so far – indicating to Maliki and his allies the extent to which he may be mistaken when he says “the system” in Iraq is immune to challenges from the people. Could it be that the system is indeed part of the problem? Update 14 February 11:05 CET: Today’s session of parliament, devoted to the law on presidential deputies and continued discussion of the budget, has been postponed until Wednesday due to a lack of quorum. Only some 130 deputies showed up. The second government of Nuri al-Maliki that was confirmed by the Iraqi parliament on 21 December 2010 was in many respects an incomplete one. No security ministers had been nominated, and these portfolios, along with almost a dozen other ministries for which the parties in government had failed to nominate candidates, were left in the hands of caretaker ministers who were already heading other jobs. Notably, these arrangements included Prime Minister Nuri al-Maliki himself with respect to his continued control of the security ministries. In today’s session in the Iraqi parliament, some further steps were finally taken after a long period of inaction, although the government-formation process remains far from complete… Full story here. In one of the least glorious acts of his presidency, Jalal Talabani has asked the Iraqi parliament to amend tomorrow the newly passed law on “one or more deputies for the president” so that the number of deputies can be expanded from three to four. Some reports even say Talabani has specifically requested that the law reserve the fourth seat for a Turkmen (the three persons already nominated are two Shiites and one Sunni Arab). The realpolitik behind this move is as follows. The two biggest Kurdish parties promote a vision of Iraqi politics in which ethno-sectarian collective groups rather than the individual citizens are centre stage. In accordance with this policy, the Kurdish parties ask for ethno-sectarian quotas in government (percentages of jobs that will go to Kurds), identify “disputed territories” (where a majority of people defining themselves as “Kurds” live) and have introduced the general concept of “racial entitlement” (istihqaq qawmi) as a means of justifying these demands. Another facet of this strategy is to make as many non-Kurdish Iraqis as possible think of themselves as members of ethno-sectarian communities too, as seen particularly in the way the Kurds have been building relationships with Iraq’s Christian communities. The latest step, then, is to reach out to the Turkmen community through the promotion of a separate Turkmen vice-presidency. This strategy makes sense for the Kurds, firstly since they need to win over Turkmens in order to advance their aim of territorial annexation of the disputed city of Kirkuk, and secondly since they are much less worried about the Turkmen as a minority community than the prospect of Turkmens and other non-Kurds joining a strong Iraqi nationalist party. Briefly put, to the Kurdish strategy, it is a good thing when the Turkmens emulate their calls for “racial entitlements” – a concept that does not occur in the constitution – instead of joining other Iraqis in cross-sectarian parties. At the same time, it is a move that will pay off nicely for Talabani, since his deputies according to the law has no other powers than what he himself delegates to them from his own, largely ceremonial prerogatives. Nonetheless, Talabani has succeeded in prompting Turkmen politicians to fight among themselves for a deputy president position that has only symbolic value, while at the same time sacrificing opportunities to obtain ministries where they could have played a more national role. Tomorrow’s other main scheduled event in parliament, the second reading of the budget before it goes to a vote later in the month, exemplifies the potential benefits to the Kurds of promoting an ethno-sectarian paradigm in Iraqi politics. If ethno-sectarian identities were of limited significance, then one could expect many nationalists in the Iraqiyya movement to support the deputy prime minister, Hussein al-Shahristani, in his persistent reservations against recognising the contracts of the foreign companies operating in Kurdistan without adjustments. Conversely, if Iraqiyya and State of Law are unable to cooperate due to differences in which sectarian sentiments play a part, then the position of the Kurds is looking a lot stronger. Lately, of course, there are indeed signs that that appears to be the case, with Iraqiyya reportedly seeking assistance from the Kurds to achieve progress on legislation for the strategic policy council, another institution that just like the deputy presidencies will help enshrine a sectarian architecture in Iraq’s political institutions. Reports that Iraqiyya have accepted the directorship of the Sunni religious endowment authority (awqaf) would just seem to emphasise this trend towards a Sunnification of Iraqiyya; as do statements by Haydar al-Mulla of Iraqiyya that they are happy with a Turkmen president to fill the third seat as long as there is not a fourth one for a second Shiite! It is increasingly unclear whether the budget text will actually clarify the exact government position on oil exports, but the debate surrounding it will no doubt be influenced by the degree to which an ethno-sectarian quota logic continues to prevail among Iraqi politicians. Some in the international community will no doubt laud Talabani for his latest move. (“Expanding the number from three to four – how did he think of that?”) Critics will point to the instrument of ever more vice presidents and deputy ministers as the cardinal symptom of a political system in great crisis, where quotas for imagined collective identities matter more than talent in providing services for individual citizens. Why stop at four vice presidents? Why not add some for the Christians and Sabaeans? There are plenty of sects and tribes that need recognition; in the end “Every Iraqi Is a Vice President” will be a suitable slogan. With hopeful signs of a no-nonsense democracy in the making in Egypt, perhaps Iraq, too, will one day get a democracy that is less characterised by exogenous forces than the current system and political culture, still rooted in the days of Paul Bremer in the years from 2003 to 2004. There are signs that Iraqis are already calling for “better services” but until they also start calling for “fewer vice-presidents” their revolution is likely to remain a frustrated one. This is becoming somewhat farcical, but today the Iraqi deputy premier for oil and energy affairs, Hussein al-Shahristani, tells Reuters that the Iraqi premier, Nuri al-Maliki, was misquoted when he said the Kurdish contracts with foreign oil companies had been approved. Shahristani reiterates the argument that he has always made about the need for the central government to review the contracts before they are approved, even going as far as explicitly saying they need to be converted to technical service contracts (more similar to what is being used by the central government for oil contracts in the south). It is rather remarkable for the deputy premier to contradict the premier on such a key issue, and the suggestion about a “misquote” does not quite make sense: Maliki was presenting an elaborate argument about the geological differences between Basra and Kurdistan and the interview included several comments which all went in the same direction. Surely no simple “misunderstanding” can assert itself in this way across a whole section of an interview even though it seems likely that the interview with Shahristani was conducted in English and the one with Maliki in Arabic? Nonetheless, the refutation seems to reflect the prevailing mood in the Iraqi oil ministry, where Reuters reported astonishment and even disbelief during the weekend when the news of Maliki’s comments broke. No one, it was said, had heard anything. So who is right and who is wrong? On the one hand, Shahristani himself has a record of recent misquotes, as when he allegedly said Iraq would reach an oil production of 4 million barrels per day at yearend – a figure which was promptly adjusted downwards by one million bpd by the oil ministry. But Maliki has also been acting strangely since the start of his second term. First, there was the seemingly suicidal attempt to alienate almost every force in Iraqi politics by attaching IHEC and other independent commissions to the executive, which just weeks ago brought about an alliance of critics reminiscent of the opposition Maliki was facing in early 2010 at the time of the budget. And then there was this latest episode involving the Kurdish oil deals, in which Maliki seemed to abruptly give up his pretensions to keep Baghdad as the ultimate power broker as far as the energy sector is concerned. Perhaps what we are seeing is Maliki’s old tendency of turning to the Kurds in times of trouble, which was evident already in autumn 2009. If that is the case, the key question is how many members of his own Shiite alliance are willing to follow him in that direction, and how far are they willing to go when it comes to making concessions to the Kurds on issues like oil/energy, Kirkuk and generally enshrining the kind of quota-based, ethnicity-oriented political system that the Kurds are seeking. The latest move by Maliki was surprising in that it seemed to indicate that Shiite attempts to assert a centralist policy in energy questions were dead; Shahristani’s response today suggest that the centralist/nationalist element in the National Alliance, which also includes Sadrist and Turkmen components, is still there and at least is putting up some kind of resistance when it comes to independent energy deals by provincial authorities. Alongside Maliki and Shahristani, a third force to watch for is erstwhile Daawa member Ibrahim al-Jaafari, now parliamentary head of the National Alliance bloc, who is cutting a dominant figure both in parliament and at NA meetings, sometimes at the expense of Maliki himself. Jaafari was famously deselected as premier for a second term in 2006 thanks in part to Kurdish pressure. A meeting of the National Alliance on 31 January 2011. 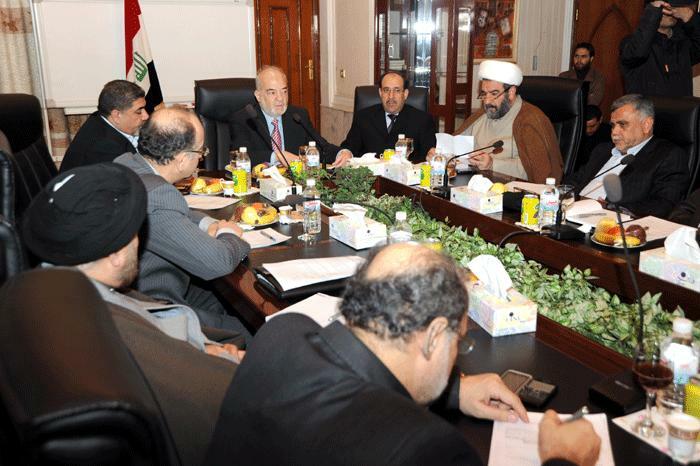 Maliki is sitting to the right of Ibrahim al-Jaafari. Meanwhile, parliament was supposed to have done the second reading of the budget today, but the budget had not arrived in parliament from government! The second reading was postponed until tomorrow, to be followed by a vote later in February. The other big news out of Iraq over the weekend, in addition to the story involving the Kurdistan oilfields, was the first reading of the law on the federal supreme court in parliament yesterday. The reason this piece of legislation has suddenly been fast-tracked in the Iraqi parliament is as follows. The constitution adopted in 2005 calls for special legislation to establish a federal supreme court, to be passed by a two-thirds-absolute majority in the Iraqi parliament. In 2006, this seemed to be a distant and unrealistic goal, and perhaps not a terribly pressing one since there was some kind of broad satisfaction with the pre-constitutional federal supreme court that had been put together in 2004. That court, which still exists, was staffed mainly with career judges, many of whom worked for the old regime, although care was taken to compose it on the basis of ethno-sectarian quota arrangements that came in vogue with Paul Bremer and his exile politicians back then. This background notwithstanding, after it showed some judicial independence in the years between 2006 and 2008, the Iraqi judiciary has increasingly been seen as a tool in Prime Minister Nuri al-Maliki’s pocket, especially after he seemed able to more or less dictate some of its decisions relating to the latest elections, including the recount in Baghdad. Most recently, a convoluted ruling by the court attached the “independent commissions” (such as the electoral commission) to the executive despite the existence of an explicit constitutional injunction that they be subject to the control of the Iraqi parliament. This in turn prompted strong reactions across the political spectrum, with Iraqiyya, Kurds and even Sadrists in Maliki’s own, all-Shiite National Alliance complaining that he had gone too far and that change was needed. The speaker of parliament, Usama al-Nujayfi of Iraqiyya, has apparently played a role in propelling the new draft law to its first reading. In evaluating the draft law, one should consider its somewhat complex origins. A draft was prepared several years ago by the existing court, which probably moulded it in a way that would guarantee continuity as far as its own members were concerned. That draft was actually read in parliament in 2008 but the government presented a number of objections which are believed to have been incorporated in the current version. The above-the-fold excitement concerning the latest draft relates to the proposed composition of the court and the mechanisms for its recruitment, all of which were left unspecified by the drafters of the constitution in 2005 because they were unable to agree on an exact formula of Islamic and secular judges. Here is the new proposal: The court will consist of 13 members altogether, including an advisory board of 4, half of which will be ordinary legal specialists and half of which will be specialists in Islamic law. In other words, the only quota for Islamic judges relates to the 4-person advisory board, which does not take part in deciding cases as such. The recruitment procedures are also remarkable: The higher judicial council, a body largely made up of career judges (and for which another piece of legislation will be read next week), will propose three candidates for each of the 9 positions in the court proper, with the field limited to judges with a service of no less than 20 years; the president of the republic will then select one of the candidates for each position (in other words, the law creates a prerogative of the president which is not described in the constitution!) As for the four members of the advisory board, four professional judges will be nominated by the ministry of higher education and four Islamic ones by the two Islamic endowment (waqf) authorities (hence, one Sunni and one Shiite), with two from each group being selected by the government and approved by parliament. The judges will serve six years; the requirement that they should not be subject to the de-Baathification law of 2008 may well be a later addition to the draft by the government since some present members of the court are believed to fall in this category themselves. In other aspects, such as the prerogatives of the court itself, the draft law seems to largely reiterate the constitutional provisions. The rather modest role suggested for Islamic judges to some extent reflects the origins of the first draft, and it would be surprising if it wins approval by the required 216 members of parliament, many of whom will be Shiite Islamists with rather bigger ambitions for the role of Islamic law in Iraqi society. Perhaps the most immediate effect of the first reading of this bill will be to put the existing court on notice and remind it about how many of its latest decisions have been perceived as highly politicised. Comments to AFP by Iraqi Prime Minister Nuri al-Maliki today on the oil deals signed by the Kurds are nothing short of sensational. That exports from the Kurdistan fields will go ahead has been rumoured for some time, but the more crucial point is the clear assertion by Maliki that the contracts signed by the Kurds with foreign companies will be honoured. To appreciate the extent of the change of Maliki’s position, one needs only remember the vehement criticism of these bilateral deals by his point men on energy issues like Hussain al-Shahristani and Abd al-Hadi al-Hassani. It was this kind of opposition that led to the breakdown of the first export attempt back in summer 2009. In fact, just weeks ago, oil ministry officials were adamant that even if the exports were to be resumed, costs only (and not profit) were to be paid to the operating foreign companies by the central government. In terms of the perennial debate about the constitutional right of provincial entities to sign contracts without reference to Baghdad, Maliki appears to sidestep the question somewhat by offering an ad hoc justification to the effect that oil drilling in the Kurdish areas is technically more difficult than in the south and for this reason it is permissible to accord greater profits to the companies that invest in the north than those operating in the south (where technical service contracts and more modest per-barrel remuneration have been the norm for foreign companies dealing with Baghdad). In this way, it looks as if the affair has been dressed up as the oil ministry “recognising” the deals because of the special geological challenges presented by the Kurdistan region, but it still begs the question of whether any deal signed by the Kurds in the future, regardless of profits etc., will automatically be recognised. The question is important, because according to the constitution, existing governorates can do exactly the same as federal regions as far as oil is concerned, and the issue of bilateral energy deals between governorates and foreign companies therefore forces its way onto the agenda as a potential domino effect that could gradually make Baghdad less influential in the energy sector (and, arguably, in governing the country as a whole). What if an existing governorate can reiterate the Kurdish argument about having a particularly challenging environment for drilling oil or gas? The political dynamic that has enabled these development has its roots in late 2009, when it became increasingly clear that Nuri al-Maliki was failing in an attempt to turn his State of Law coalition into a truly national political entity with appeal beyond the Shiite-majority areas of Iraq. Further weakened by the de-Baathification issue and results in the 7 March 2010 elections that were worse than he had hoped for, he needed both Iranian and Kurdish support to clinch a second nomination and to form the government. The Iraqiyya component in the government that was declared in late December was surprisingly strong and the Kurdish one comparatively weak, but Maliki has since come under fire for issues such as attaching the independent commissions to the executive, prompting protests from both the Kurds and Iraqiyya and even a surprise initiative to establish a new federal supreme court. In this kind of situation he is giving concessions to the Kurds even though they alone don’t have the votes to keep him in office. These developments are also a major defeat for his oil minister, Shahristani, who was unable to ramp up short-term production in the south and thereby became dependent upon comparatively modestly sized exports from the north while he is waiting for his own string of deals with foreign companies to come to fruition. The big question is how Iraqiyya will react, since its constituencies are critical of the Kurdish oil deals and concessions to the Kurdistan Regional Government in disputed questions generally. In that kind of perspective, the logical thing for it would be to withdraw from government and focus instead on an opposition role headed by the speaker of parliament, Usama al-Nujayfi (Adnan al-Janabi of Iraqiyya also won the presidency of the parliamentary oil and gas committee today). However it does seem its members are more concerned with more Byzantine ways of seeking power in government, including vice presidencies (Hashemi) and strategic policy councils (Allawi). In fact, Iraqiyya is rumoured to be asking the Kurds for help in both of these issues, signifying the extent to which Arbil has managed to come out on top in the latest developments despite a somewhat adverse point of departure. At the same time, these latest developments mark a triumph for a primitive, identity-oriented and Balkans-inspired political agenda of potentially destructive ethno-nationalism that many Iraqis had been hoping was on its way out.